MPs are awaiting the results of votes on eight different proposals for the future of Brexit. Options they are considering include leaving without a deal, a customs union and a confirmatory referendum. Speaker John Bercow will announce what support there is for each later after MPs took over the Commons timetable. Theresa May has promised to stand down as prime minister if her own deal is approved, prompting several Tory Brexiteers to say they will back it. Meanwhile, MPs have approved the legislation required to change the date of Brexit from 29 March - after the EU agreed to give the UK an extension last week. Friday had long been the day written into law for the UK to leave the EU but the Commons approved a statutory instrument - by 441 votes to 105 - changing the deadline to 22 May if a withdrawal agreement is passed this week; or 12 April if it is not. The prime minister is still trying to drum up support for her withdrawal agreement despite it being voted down by a large margin twice and the DUP saying they still cannot vote for it. The government is seeking the support of MPs for the Commons to convene on Friday, if necessary, amid reports a third vote on the PM's deal could be held then. 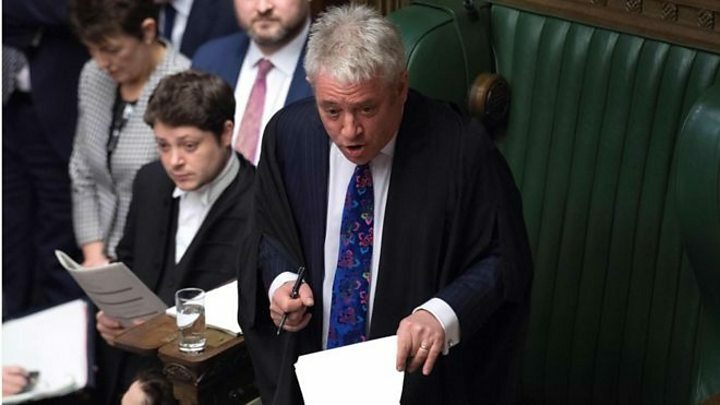 But Mr Bercow reiterated his earlier warnings that the PM's deal could not come back for a vote if it had not significantly changed. He said the government "should not seek to circumvent my ruling" by introducing procedures that could reverse his judgement. Media captionJohn Bercow: "I do expect the government to meet the test of change." But a Downing Street spokesman said there had been a "significant development" at the summit in Brussels last week, after Mrs May agreed "extra reassurances" over the Irish backstop with the EU, and the date of exit had changed. MPs are currently voting on a statutory instrument to confirm a delay, after the UK was given until 12 April to propose a different way forward if the current agreement cannot get through Parliament and until 22 May to finalise Brexit if the deal is passed. Earlier on Wednesday, MPs took control of parliamentary business from the government for several hours as they attempt to find a majority for the next steps in the Brexit process. Conservative backbencher Sir Oliver Letwin, whose cross-party proposal ushered in today's debate, said the only way leaving the EU with no-deal can be prevented is by crystallising an alternative majority and trying to carry it forward. He said that if MPs supported the prime minister's deal in another meaningful vote this would be "the easy route". But he added that he "profoundly hopes" that if on Monday there is a majority view in favour of a particular position, that the government will say that it will carry that forward. Never afraid of stoking controversy, the Speaker has again infuriated many Tory MPs with his latest surprise pronouncement to the Commons. Just as it seemed the government was poised to try and get its Brexit deal through again, John Bercow took it upon himself to tick ministers off before they had even tried. Why? Because last week he ruled the deal could not be brought back to the Commons for a third time without "substantial" changes. No 10 will only bring the deal back for a third vote if it thinks it could pass. That probably requires DUP backing and a guarantee some Labour MPs will vote for it too. As it stands, there isn't yet a majority for the deal, but the mood is shifting fast. Read more from Ben here. What options are MPs voting on? Groups have put forward different options for the UK's future relationship with the EU, with several based on the assumption Mrs May's withdrawal agreement with the EU will be approved - albeit with changes to the controversial Northern Ireland backstop. The Speaker of the House, John Bercow, chose eight to be voted on by MPs. After a four-hour debate on each proposal, MPs were given a piece of paper listing the options, and had to mark each one with a "yes" or "no". MPs used both lobbies for completing the ballots in a process that took about half an hour. 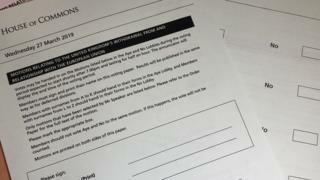 Several MPs, including Tory Michael Fabricant and Lib Dem Jo Swinson, posted images of their forms on social media. How are MPs likely to vote? Conservative MPs were given a free vote, meaning they were able to support or reject any proposal without pressure from party whips. Cabinet ministers will be abstaining. The decision followed warnings that more than a dozen ministers might quit if they were told they had to follow party orders. Labour MPs are being whipped to support the party's own proposal, as well as motions on a customs union, Common Market 2.0 and a confirmatory public ballot. Mr Starmer told the Commons any deal "needs further democratic approval" before being enacted. But the move has angered Labour MPs in Brexit-vote constituencies, with Great Grimsby MP Melanie Onn reportedly resigning as a shadow housing minister. Brexit: How did my MP vote on taking control?